Dmitry Krymov is a Russian artist who, since only 2004, has built an international reputation through performances that are directed, devised, and performed, perhaps surprisingly, by stage designers. He uses motifs from the well of his imagination and that of other designers (often his present and past students) and brings them together with assorted images from paintings, poems, prose, plays, and popular culture to create phantasmagorical, one and only performances. Following no obvious linear narratives, no literary dramaturgy as such, the intense visual and thematic images and sensations built up on Krymov’s stage may be seen as dynamic montages. Montages because they combine visual and aural elements from various sources; dynamic because the designers construct and deconstruct them literally before our eyes. Newspaper, magazine, and Internet articles — nearly all in Russian but a few in English — have already been written about Krymov, including interviews with him and his students and coworkers as well as reviews of his performances.1 And in 2009, Maria Punina, art historian and Cultural Editor for Radio Russia, wrote a dissertation about Krymov for her Ph.D. from the Russian Academy of Theatre Arts.2 Until now, however, there has been no serious attempt in English to study Krymov’s work. This article attempts to provide an introduction to his work for an English-language readership and to point to the importance of his teaching and directing practices. Dmitry Krymov was born in Moscow in 1954, the only child of famous parents — the director Anatoly Efros (1925-87) and the theatre critic and historian Natalia Krymova (1930-2003). Because of the complicated history associated with the name of Anatoly Efros in the Soviet era (not least its distinctively Jewish denotation), his parents decided that their son should take the last name of his mother to avoid potential obstacles in his future career path. In 1976, Krymov graduated from the Stage Design programme of the Moscow Art Theatre School. During the next nine years, he worked primarily in support of his father’s performances at the Malaya Bronnaya Theatre, Moscow Art Theatre, and Taganka Theatre, where the latter was Artistic Director between 1985-87. After Efros’s death in 1987, and for the next twenty years, Krymov designed over one-hundred productions for an assortment of directors and theatres in Moscow, St. Petersburg, Riga, Tallinn, Sofia, Tokyo, and Paris. Krymov returned to theatre in 2002, when he was invited to join the Stage Design Programme of the Russian Academy of Theatre Arts [RATI].4 Later the same year, he staged his first performance as a director with a production of Hamlet at the Stanislavsky Theatre. He called this effort ‘simply a try’.5 In 2004, he was asked to head his own five-year course in stage design, which allowed him to develop an innovative curriculum anchored in project-performances with his students. Their year-end final projects comprised two productions — Untold Fairy Tales (2004, based on various Russian folk tales), and Buritano (2004, based on the 1936 retelling of the Pinocchio story in The Golden Key by Aleksey Tolstoy). The avant-garde director Anatoly Vasiliev was impressed by these stagings and suggested to Krymov that they should be included in the repertoire of Vasiliev’s noted School of Dramatic Art. Thus was born the independent, experimental, creative collective called Dmitry Krymov’s Theatre Laboratory. Since then, in conjunction with the productions that he continues to produce with his students at RATI, Krymov has added professional productions, whose troupes have been regularly replenished with stage design graduates from RATI and with young acting students from RATI, the Schukin School of the Vakhtangov Theatre, and other Moscow theatre schools. Anchored instructionally to RATI and practically to Vasiliev’s School of Dramatic Arts, Krymov’s Theatre Laboratory went on to produce Three Sisters (2004, a RATI production based on King Lear), Sir Vantez: Donky Hote (2005, a RATI production based on a student’s comical mis-hearing of the author and title of Cervantes’s novel), and Auction (2005, a professional production based on fragments from Chekhov’s plays). In 2008, another shift occurred in the direction of Krymov’s career path attributable to what some of his stage design colleagues perceived as his unorthodox and ineffective teaching methodology. Education in Russia is mainly provided and prescribed by the state at all levels. At colleges, universities, and specialized institutes — such as RATI or the Moscow Art Theatre School, for example — the student’s specialization (major) is permanently fixed upon admission. Curricula, too, are fixed for the entire duration of study, leaving students with little say in the planning or sequencing of their academic progress. On the other hand, specialized institutes offer an impressive breadth and depth of subject matter. Krymov is himself a product of such a curriculum at the Moscow Art Theatre School and — despite the censorship in operation at the time — still has fond memories of his instructors, the quality of their teaching, the family atmosphere within the school itself, and the creative work that he and his fellow students managed to accomplish there. As a member of the RATI stage design faculty, Krymov was naturally expected to accept the feasibility of this sort of curriculum and make use of its time-tested teaching methods. For a time he effectively did so as a guest instructor in the course led by Sergei Barkhin. But however much Krymov valued his own education, he began to consider a different approach for himself when it came to teaching a new, post-Soviet generation of stage design students. For as valuable as the comprehensive training in fundamentals was at MAT School and other theatre institutes, to him that sort of learning experience lacked three essential learning components: how to think as an artist does, how to experience stage space psycho-physically, and how to work collectively toward an original performance before the public. To some extent, classroom and studio projects in the standard curricula involved these components, of course; but for Krymov, the shift from small, narrowly defined classroom and studio projects at the theatre institutes to the vast and precarious world of professional theatre ‘was like experiencing the ocean after swimming only in a pool or a beautiful lake or a river. But [professional work] was like the ocean’, he said, ’another kind of energy’.7 Krymov was sharply aware of this ‘affective memory’ experience of his and wanted to show his students how to come to terms with that feeling before they ventured into the profession. Readers can probably imagine the resistance Krymov encountered from his colleagues on the stage design faculty about such a teaching methodology. His students were not learning the required fundamentals, said the head of the programme. Their basic skills were not improving at the expected pace and therefore their progress toward graduation was not on a par with the other stage design students who were taught in the customary manner.9 To this criticism, Krymov responded that he was teaching students how to think as artists in the high-pressure collective process of theatre; they could learn design fundamentals as they progressed through his practical, student-centered instructional programme. Nevertheless, it seemed to his RATI colleagues that Krymov actually wanted to be a director. Everyone knew that his father had been a successful director and that Krymov himself had recently directed an innovative, empty-stage performance of Hamlet, even using well-known stage and screen actors. On the other hand, stage design students were clamoring to get into his course, and there was also the irrefutable reality of the media hype and the prestigious awards that his performances were receiving. In the end, a compromise was reached. Krymov would be transferred to RATI’s Directing Programme, whose faculty members in any case were ready to accept him along with the publicity and increased prestige his presence brought to their faculty. He was to become Head of an ‘Experimental Theatre Project’. Stage design students were still allowed to study with him if they agreed to an additional round of entrance requirements, which he alone would specify. Interested student actors and directors could participate now, too. Thus, for the first time in the history of Russian theatre instruction, students began to have an opportunity to master their profession in a unique form of co-authorship. Moreover, thanks to support from Anatoly Vasiliev’s School of Dramatic Art, Krymov was given access to Vasiliev’s former rehearsal and performance venues for his teaching and independent performances — venues consisting of several workshop spaces in a partly-renovated apartment building on Povarskaya Street and the impressive new multi-form facility of the School of Dramatic Art on Stretenka Street. This potentially embarrassing change of circumstances actually worked to Krymov’s advantage. He embraced the surrounding publicity, took advantage of opportunities for sympathetic financial support, and rose to the challenge of competition with his senior colleagues by significantly expanding his creative horizons. Students from his first five-year course have gone on to work at important Russian theatres and have already received their own awards for scenographic design. In 2009, students from his second five-year course opened their first production, Katerina’s Dreams. And while continuing to refine his unique style of teaching and performance, he has produced two of his most ambitious productions to date. Together with Vera Martinova and Maria Tregubova (recent graduates of his first course), he created the award-winning Opus No. 7 (2008, a two-part professional production based on musical and visual motifs from the life and work of composer Dmitry Shostakovich). No less important in this family portrait was Krymov’s mother, the theatre historian, critic, journalist, and teacher Natalia Krymova. She too was a graduate of GITIS, where she studied under Pavel Markov, Literary Manager of the original Moscow Art Theatre. From 1956-1972, she was a contributor to and later a member of the editorial board of Teatr, Russia’s leading theatre journal. For the next thirty years, while contributing to various newspapers, magazines, journals, and anthologies, she worked as an interviewer and broadcast journalist covering issues about theatre, literature, and concerns of Russian culture in general. In 1989, she began teaching in the National Theatres Programme at GITIS and was the head teacher of several courses there. Krymova was also author of three volumes of theatre profiles and a theatre appreciation textbook, and was widely considered to be one of the leading theatre critics of her time. Equally relevant here was her editorial work on the writings of two hugely influential figures in the Russian theatre: the aforementioned Maria Knebel and Michael Chekhov.15 The influence of Efros and Krymova on their son must have been substantial to say the least, at any rate on the subjects of literary analysis and aesthetics if not actual practice. Influences on Krymov’s practice in itself can be traced more profitably to a previous generation of Russian stage designers. Ever since the appearance of the Russian avant-garde (1890-1935), Russian art and stage design has been regarded as imaginative and ground-breaking. Between the years 1913-35, the avant-garde reached its peak of creative and popular success with artists and designers such as Marc Chagall, Wassily Kandinsky, Kazimir Malevich, Varvara Stepanova, Lyubov Popova, and Vladimir Tatlin; composer Alexander Scriabin; directors Vsevelod Meyerhold, Evgeny Vakhtangov, and Alexander Tairov; and film makers Vsevelod Pudovkin and Sergei Eisenstein. Stalinism ruptured this unique and vibrant tradition for the next generation, however, by installing a deadening, state-supported artistic style known as Socialist Realism. Oriented toward the advancement of socialism and communism, Socialist Realism was a government-enforced policy that suppressed any form of art, whether literary or visual, which did not conform to the ‘dictatorship of the proletariat’. After the death of Stalin in 1953, a gradual slackening of government control over the arts began to take place. During this period, known in Russia as the Thaw, new artistic themes began to emerge, and the influence of the early avant-garde, formerly hidden underground, began to make itself felt once again. Sergei Barkhin and David Borovsky were among the first stage designers to show signs of this influence. Barkhin (b. 1938) was the earliest Russian designer to reveal a postmodernist spirit in his work. His designs are open and engaging, playing with different historical styles, containing decorative forms from historical theatres, combining images and real objects with frankly theatrical props, and — most important — making use of natural, untreated materials. For many years, Barkhin’s name was associated with the most important Moscow theatres — the Maly Theatre, Moscow Art Theater, Mossoviet Theatre, Stanislavsky and Nemirovich-Danchenko Musical Theatre, and Bolshoi Theatre (Chief Designer 1995-2000). All the same, some of his most notable recent designs were done at the Moscow Theatre for Youth (TYUZ) in association with the eminent directors Henrietta Yanovskaya and Kama Ginkas. Barkhin’s Visual Poetics, 11 designs had a measurable influence on an entire generation of designers, not least on Krymov. 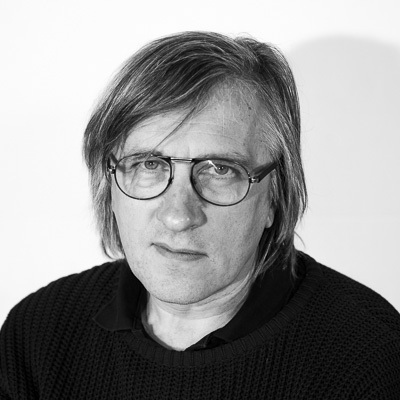 More to the point at this juncture, Barkhin is the founder (1992) and Head of the Stage Design Programme at RATI. He was the single person most responsible for inviting Krymov to teach in the Stage Design Programme and later for exiling him to the Directing Programme. To Barkhin’s penetrating artistic images and utilization of unfinished materials, David Borovsky (1934-2006) added earthiness and striking dynamism. Like Barkhin, he also worked with many prominent directors — notably, Anatoly Efros. However, Borovsky was primarily distinguished for his productive, thirty-year association with director Yuri Lyubimov at the Taganka Theatre. Borovsky generally created his designs from a limited number of simple elements. Very often, household things from everyday life; things that spectators could recognize and which often held deeply personal or historical associations in addition. On stage, these everyday objects acquired a totally new and philosophical character. For example, ordinary, shabby, stuffed chairs in Vladimir Vysotsky (1981) and a camouflaged WWII flatbed truck in The Dawns are Quiet Here (1971). Most famously, for Lyubimov’s production of Hamlet (1971), Borovsky created a full stage ‘living curtain,’ fabricated from roughly sewn burlap, leather, and wool, and which moved around the entire space according to the action, a dynamic participant in the performance as a whole. ‘Eventually, [Borovsky’s dynamic] understanding of theatre became known as ‘active design’. His work was not so much the creation of a place where things happened — it was the action itself. Design became as important to the production as the work of the actors. It was an action shaped by content, a physical transformation of the play's ideas and narrative’.16 Although Borovsky never studied or taught design, he considered Krymov to be ‘one of his two true pupils’, and conversely, Krymov considers himself to be a faithful disciple of Borovsky. On the other hand, as I have argued elsewhere, even novel and unusual theatrical developments, such as those of Dmitry Krymov’s Laboratory, continue to employ the basic features of dramatic form, although in non-standard ways.’23 If this is true, then Aristotle’s basic terminology should be capable of providing ways to understand them. Furthermore, there should be no need to change the standard vocabulary or other means of coming to terms with such plays/productions. The degree of involvedness is without doubt greater than with more conventional stage works, but the danger of being ‘out of sync’ with contemporary mentality is a worse problem. As is well known, Aristotle’s Poetics privileged plot as the ‘first principle and, as it were, the soul’ of drama and, by logical extension, the soul of production as well.’24 And plot, it will be remembered, was for Aristotle not simply a mechanical engineering of events so as to produce entertainments, but a special arrangement of those events in such a way as to express a ‘complete action’. This complete action Francis Fergusson explained as ‘the movement of the psyche toward the object of its desire’, which is the source of the play/production’s internal unity and therefore its artistic significance.25 In those plays Aristotle knew, all the other elements of theatre derived their distinctiveness from that of plot, and their kinship to plot determined the order of their importance in the dramatic work/production as a whole. Accordingly, plot begets character, which begets idea, which begets dialogue, which begets spectacle (production values), which begets ‘music’ (tempo/rhythm/mood).’26 It is not hard to see how the balance among these elements (the style of the play/production) has varied greatly over time. Sometimes leaning more toward character (Chekhov, Williams), or toward idea (Brecht, Pinter, Asian theatre), or toward language (Shakespeare, Shaw), or toward music (tempo-rhythm-mood) (Maeterlinck, Eliot, musicals and opera). Moreover, the underlying principles of the Independent Theatre Movement (Theatre-Libre, Freie Buhne, Moscow Art Theatre, Theatre de l’Oeuvre, and many others since then) were based on a ratio of formal elements intentionally different from that advocated by Aristotle. Whenever the balance has tended measurably more toward production values in themselves, however, the results have commonly been criticized for being too ‘theatrical’ or ostentatious (lacking in artistic seriousness). Krymov’s Theatre Laboratory has changed all that. Although his work retains connections with the historical avant-garde, and even employs certain features of Stanislavsky’s system, it is nevertheless a genuine ‘paradigm shift’ in theatre performance: not a theatre with production values but a theatre of production values. Contra Aristotle, plot and character are present but negligible and laconic; idea is present too, but oblique not explicit; dialogue by itself is practically nonexistent; music (tempo-rhythm-mood) is present but restrained. On the other hand, spectacle is of paramount importance. Here are found memories of Roger Planchon’s ecriture scenique (scenic writing), Robert Wilson and Richard Foreman’s ‘theatre of images’, and Tadeuz Kantor’s use of actors as archetypes in his performance art. There are, however, significant differences.27 Krymov’s theatre does not present a sequence of images ready-made, but actually creates (and destroys) those images before our eyes. Furthermore, rarely does his theatre use performers as conventional or archetypal characters, but typically as disinterested building blocks in an intricate and dynamic visual system. Indeed, his use of performers as nonfigurative ‘somebodies’ is one of the main characteristics of his work. Punina cleverly observed that an unusual relationship develops between performer and image similar to that of M. C. Escher’s ‘Drawing Hands’, which depicts two hands facing each other in the act of drawing one another into existence.28 In Krymov’s performances, however, the hands are alive; and what appears in Escher’s work to be a visual paradox, becomes in Krymov’s work a series of living, breathing events. No less innovative, and perhaps even more significant in the long run, is Krymov’s pedagogy. Some of his teaching is not unconventional by standards in the West, where stage design students tend to be involved in practical work as designers or designer’s assistants on a regular basis. Devised theatre (collaborative creation) is not necessarily a new phenomenon either. Its roots can be traced as far back as commedia dell’arte and more recently to the work of Jerzy Grotowski, Theatre de Complicite, Peter Brook, the Wooster Group, and Pina Bausch, among others. But there are differences from Krymov here, too, since existent devised theatre practices, books, and programmes are intended primarily for actors and directors. What distinguishes Krymov’s teaching is that practical work and devised performance are tailored specifically for the distinctive mentalities of visually- and spatially-oriented artists, rather than actors or directors. Krymov understood that, correctly employed, Active Analysis can be an invaluable teaching tool for stage designers because it takes the form of physical action in three-dimensional space, which in turn requires the students to experience the essence of their work psycho-physically instead of merely intellectually (for example, at the table spoon-fed by a director). Students approach their work step by step and logically through physical actions expressed not by acting but by ‘cobbling together props, costumes, and other objects using hammers, scissors, knives, cardboard, shocks of cloth, wire, string, felt pens, paint, clay, and a host of other materials’, objects readily at hand in any stage design shop or studio.’29 Except there is even more to Krymov’s teaching than the collection of free-form visual improvisations Freedman’s account may call to mind. It is also founded on the comprehensive theoretical foundation of Eisenstein, Picasso and Meyerhold’s concept of montage referenced earlier. Working in an analogous manner except with actors, is Eugenio Barba (b. 1936), founder of the Odin Theatre and the International School of Theatre Anthropology. He writes about two sorts of montages at work in the development of his devised performances: the performers’ montage and the director’s montage.’30 Krymov’s stage design students develop such performers’ montages improvisationally, and eventually they find themselves working inside a performance system codified by a ruling montage built up from their work by Krymov. His is a director’s montage that weaves together the individual montages of the performers into a succession in which each performers’ montage seems to act in response to another and in which all the montages derive an internal unity from the fact of their mutual existence. Unsurprisingly, the actual process is not quite as amorphous as this intellectual summing up implies. Krymov and his students spend days, sometimes months, of preliminary discussion searching for precisely what it is that they wish to explore in their evolving performances. And then for a teacher there is always the skill levels of individual students to take into account. In any case, Krymov’s is clearly a radical and time-consuming form of pedagogy. Only time will tell whether other stage design teachers will come to recognize the remarkably effective outcomes of this approach. Krymov has expanded the range of resources theatre artists can use. His performances and pedagogy have revealed new processes that allow actors, directors, designers, devisers of new works, and teachers to reach toward an idea, a play, a course of instruction, or other creative construct and express that idea with a wider variety of means. He has also opened up new possibilities. What may have traditionally been considered a limit — as between performance and design, text and design — is shown to be something that can be overcome. For example, the premeditated presence of designers within the performance itself, not merely as nonrepresentational stagehands like those found in Asian theatre, but as active contributors to the concept of the overall production. Dmitry Krymov’s importance lies not only in a new type of visual expressiveness, but also in the rehearsal and teaching processes, and in the use of production values to connect theatrical images together in fresh and sharply contemporary ways. Without a doubt, he is one of the most innovative theatre artists to emerge in the last decade. 1 Russian-language commentary, interviews, videos, and reviews about Krymov and his work are too numerous to list here. However, a representative sampling can be found by searching for Dmitry Krymov on the Internet. 2 Maria Punina, ‘Teatr Vizualnovo Obraza: Laboratoria Dmitria Krymova’ (The Theatre of Visual Images: Dmitry Krymov’s Theatre Laboratory), dissertation, Russian Academy of Theatre Arts, 2009. 3 Krymov’s portrait of John Paul II was commissioned by the Vatican as a birthday present for the Pope and is now part of the permanent collection at the Vatican Gallery. 4 Initially established in 1878 under the sponsorship of the Society of Music and Drama, revamped in 1922 by Meyerhold as the State Institute of Theatre Training (aka GITIS), and nowadays designated as the Russian Academy of Theatre Arts (aka RATI). 5 Dmtry Krymov, personal interview with the author, 20 June 2002. 6 Randy Gener, ‘All the World’s a Pavilion’, American Theatre (September 2007), pp. 30-35, 88-89. 7 Dmitry Krymov, personal interview with the author, 22 June 2009. 8 Maria Punina, ‘Teatr Vizulanovo Obraza,’ p. 17-19. 9 Adrian Giurgea, ‘When Designer and Actor are One’, American Theatre (January 2009), p. 46-47, 146, 148. 10 John Freedman, ‘Chekhov Days Fest for 150th Birthday’, The Moscow Times, 27 January 2010, 26 November 2010 <http://rbth.ru/ articles/2010/01/27/27110chekhov.html>. 12 Sharon Carnicke, ‘The Knebel Technique: Active Analysis in Practice’, in Actor Training, ed. by Alison Hodge, 2nd edn. (London: Routledge, 2010), p. 99-116. 13 See Anatoly Smeliansky, The Russian Theatre after Stalin (Cambridge: Cambridge University Press, 1999), p. 58-70, 110-125. 14 See Anatoly Efros. The Joy of Rehearsal (Amsterdam: Peter Lang, 2006); The Craft of Rehearsal (Amsterdam: Peter Lang, 2007); Beyond Rehearsal (Amsterdam: Peter Lang, 2009). My translations. See also, Maria Shevtsova, The Theatre Practice of Anatoly Efros, Theatre Papers, 2nd series (Devon, UK: Dartington College of the Arts, 1978). 15 Natasha Krymova’s two-volume, Mikhala Chekhova: Literaturnoye Naslediye (Michael Chekhov: Literary Heritage) (Moscow: Isskustvo, 1995), contains Chekhov’s entire written legacy, the majority of which has not been translated into English at the time of this writing (January 2011). 16 Giurgea, ‘Designer and Actor,’ p. 47. 17 John Freedman, ’Dmitry Krymov Designer's Theatre,’ TheatreForum 32 (2008), pp. 13-18 (p. 15). 19 Elinor Fuchs. The Death of Character: Perspectives on Theater after Modernism (Bloomington: Indiana University Press, 1996). 20 Peter Szondi. Theory of Modern Drama (Minneapolis: University of Minnesota Press, 1987 ). 22 Tori Haring-Smith, ‘Dramaturging Non-Realism: Creating a New Vocabulary’, Theatre Topics 13.1 (2003), pp. 45-53. 23 James Thomas, Script Analysis for Actors, Directors, and Designers, 4th edn. (Boston: Focal Press, 2009), pp. x-xi. 24 Aristotle, Poetics, ed. by Francis Fergusson, trans. by S. H. Butcher (New York: Hill and Wang, 1961), p. 63. 27 Significantly, Krymov, Wilson, and Kantor were visual artists before and/or during their work in the theatre. 28 Punina, ‘Teatr Vizulanovo Obraza’, p. 47. Also worth mentioning in this context is the resemblance between Krymov’s painting, A Kiss before a Palette (Figure 1) and Escher’s Drawing Hands January (1948), 10 February 2011 <http://www.mcescher.com/>. 29 Freedman, ‘Dmitry Krymov’, p. 4. 30 Eugenio Barba, ‘Dramaturgy and Montage’, in The Routledge Drama Anthology and Sourcebook, ed. by Maggie B. Gale and John F. Deeney (Abingdon and New York: Routledge, 2010), pp. 816-828 (pp. 820-21).